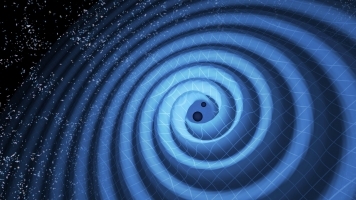 After decades of research, Rainer Weiss, Kip S. Thorne and Barry C. Barish first observed a gravitational wave in 2015. Three American physicists won a Nobel Prize for their historic detection of gravitational waves. If that sounds familiar, it's probably because Albert Einstein predicted the existence of gravitational waves just over a century ago. Gravitational waves are ripples in the fabric of space-time caused by some of the most energetic events in the universe, such as merging neutron stars. After decades of research, Rainer Weiss, Kip S. Thorne and Barry C. Barish first observed a wave back in 2015. All three physicists played a leading role in the Laser Interferometer Gravitational-Wave Observatory (LIGO) experiment. It's believed that gravitational wave was caused by two black holes colliding about 1.3 billion light years away from Earth. Weiss, Thorne and Barish will share the Nobel Prize in Physics honor and the $1.1 million prize. On Monday, three other American scientists won the Nobel Prize in physiology or medicine for their work on circadian rhythms.